Leave your cell phone behind and fall off the grid with June Carey’s "Rio Marina." A magical little harbor on the island of Elba, off the coast of Italy, Rio Marina is an ancient place where family and friends embrace the traditions another era. 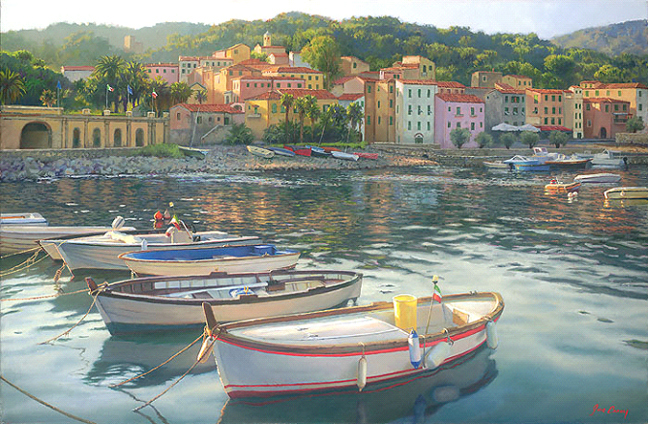 This serene harbor view was inspired not only by the location, but by the people who live there as well. As June Carey relates, “The night I arrived, I was tired and went back to my hotel room. It was right behind that wall on the left, behind the trees. It was warm, in the 70s and 80s at night. From my balcony I could hear live music, traditional Italian songs. I was curious and went out to see. Set up where those arches are on the left was a tiny platform with an awning. “An older man, with a wondrous, soft, raspy voice, sang to the music from a small sound system. People gathered around and sat on the seawall you see in the painting, to listen and watch. They brought bottles of wine with them. There was a small group who seemed to know each other and they were dancing to the old folk songs as this wonderful man played. Anyone could get up and try to dance. “There was a cafe and a restaurant nearby, along the seawall and people sat at tables outside, laughing, eating and drinking. In the harbor the lights of the boats danced on the water as the music played. Even the gigantic ferry that had brought me was still out there with its flashing lights and you could see the captain and crew hanging out on deck enjoying the music, too.